One of the things that drew me to herbal medicine is the ease and simplicity with which you can transform plants into potent healing products, with few ingredients and just a little know how. Many herbal remedies are based off of a handful of base ingredients that are useful to have on hand in their own right and which can then be used in more complex formulations. One of these is infused botanical oils, which are incredibly easy to prepare and can then be used as a base in balms, soaps, creams or even just on their own. Botanical oils are generally speaking a maceration of plant parts (either flower parts or leaves) in an oil base which are left to slowly infuse over time. The fat-soluble active constituents of the plant are extracted into the oil, leaving you with an oil brimming with healing properties. The idea with a solar infused oil is to leave the oil somewhere where the sun can heat the jar gently to help with the extraction process. Calendula infused oil is a great base to include in herbal formulations or on it's own to soothe dry and irritated skin, especially on sensitive skin and is safe to use on children. A calendula infused oil is useful to have on hand as it can be used either on it's own applied directly onto the skin, or in balms, lotions and creams. Calendula is a panacea for many skin conditions, and can be used both internally and externally. 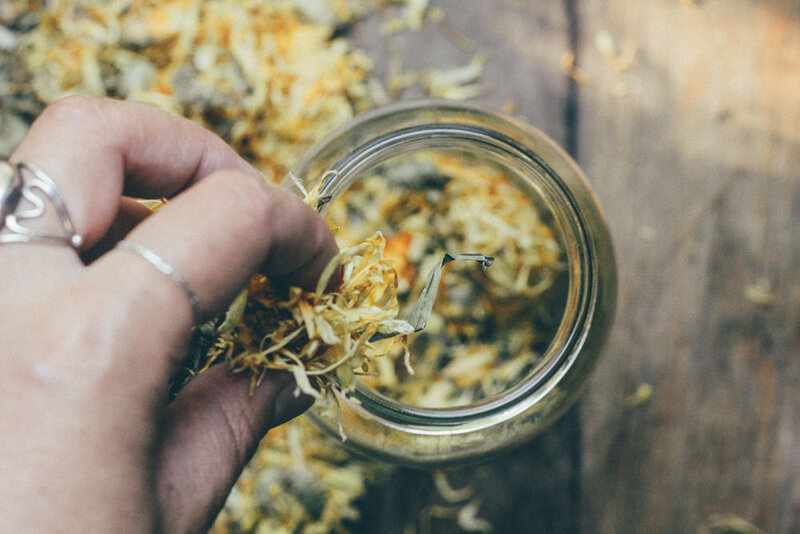 Calendula flowers are used in traditional herbal preparations to soothe and heal minor wounds and cuts, insect bites, acne, rashes, eczema, burns and chapped skin. Calendula displays powerful antiseptic and antimicrobial properties while also having a soothing and protective effect on the skin. Garble the calendula flowers if needed, removing any stray twigs and foreign parts of the plant other than the flower head and petals. Grind the flowers in a mortar and pestle until reduced to a fine size. Put the dried flowers into a 1 litre capacity glass jar. Pour the olive oil over the dried flowers, until they are completely submerged and there is around 1 inch of space left in the neck of the jar. Use a stick to mix the flowers until they are completely covered in oil and any air bubbles have disappeared then cap the jar tightly. You may need more than 500ml of oil for this, and that's fine, just use what you need. Place the jar into a brown paper bag somewhere it will receive indirect sunlight. Some spillage may occur so It's a good idea to place the jar either in a bowl or somewhere that won't get ruined if some oil escapes as the herbs expand. Let sit for between 2-6 weeks. The longer you leave the herbs, the more potent the oil, however don't leave for too long or you might end up with some spoilage. After the herbs have sat in the oil for the desired amount of time, strain the oil into a bowl through some cheesecloth. Repeat this straining process until you have a clear, particle free oil. Discard the herbs into the compost, and store your infused oil in an amber bottle in a cool dark place. Olive oil bases will last a good two years, sunflower oil 1 year, almond oil 1 year and jojoba oil up to 5 years.